90-day Warranty from Lifetime Products. 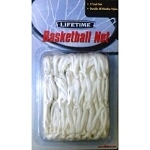 Replace your standard-sized basketball net with this 120 gram net from Lifetime Products. The 0790 is made with knotted-polyester and is great for both indoor and outdoor use. This net fits any standard (18 inch diameter), 12-loop rim. 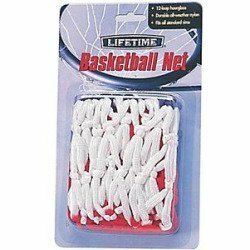 This 0790 Lifetime basketball replacement net comes with a 90-day warranty from Lifetime Products for United States and Canada customers. 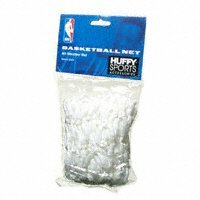 We also sell the lighter, 50 gram Lifetime basketball replacement net. Material of constructions: all-weather knotted polyester. Comes with a 90-day warranty from Lifetime Products. Attaches to 18 inch diameter, 12-loop standard basketball rims. It was an extremely easy and quick process to find, then purchase this product. Normal cotton nets wont stand up to the elements and use. I wanted to make sure to purchase the net that would compliment the Lifetime goal. The price was SIGNIFICANTLY less than Dicks. Throw in the the shipping and the net was STILL less! Not much to review. The net was as advertised. The company is great. Q: How do I know if this net can attach to my rim? A: As long as your have a standard rim - an 18-inch diameter and a 12-loop attachment - this net will attach just fine to your existing system. Q: Who handles the warranty claim? A: The warranty for this product is through the manufacturer, Lifetime Products. They can be reached at 1-800-225-3865. Get fast shipping! 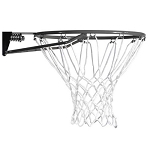 Orders for the 0790 basketball net generally leave the warehouse in Clearfield, Utah within 2 business days. Orders for this product ship via USPS. No signature required.